What is it that distinguishes crime fiction that you can read over and over again from books that, read once, have exhausted their interest? I'm almost done reading Carlo Fruttero and Franco Lucentini's 1972 The Sunday Woman, translated by William Weaver, for at least the third time (spread out over more than 30 years). 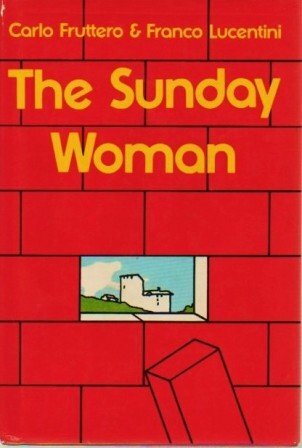 The Sunday Woman was published originally more as a mainstream novel than a work of genre fiction, and in fact is seldom cited in the U.S. as a groundbreaking crime novel (though it is). At around the same time I picked up my copy (the early '70s), I was also beginning to read the Martin Beck cycle by Maj Sjöwall and Per Wahlöö, all of which I've re-read at least once. Where the Swedish writers mixed in a lot of politics and irony as well as comedy, Fruttero and Lucentini give us a lot of comedy, satire, and social observation, without directly engaging in political commentary. Both the Swedish and the Italian collaborators structure the stories as police procedurals (rather than whodunnits or least-likely-suspect stories), which makes re-reading easier for me (the stories are all about process rather than the revelation of the murderers' identities). But is it the quality of the writing, the pleasure of the comedy, something else, all of the above that makes a crime fiction novel re-readable, a book to save and take off the shelf again and again, rather than something you simply get rid of or something that's just taking up space on a shelf? By the way, there's a movie version of The Sunday Woman (La donna della domenica) featuring Marcello Mastroianni, Jacqueline Bisset, and Jean-Louis Trintignant, made for Italian TV in the '70s—but it's only available with Italian subtitles (intended for hearing-impaired Italian speakers), not any other languages. What a shame, it should be more accessible (though there's apparently a new Italian mini-series based on the book that is being considered for international release).